After a very nice curry cooked up by Tony, we take it real easy the next morning. 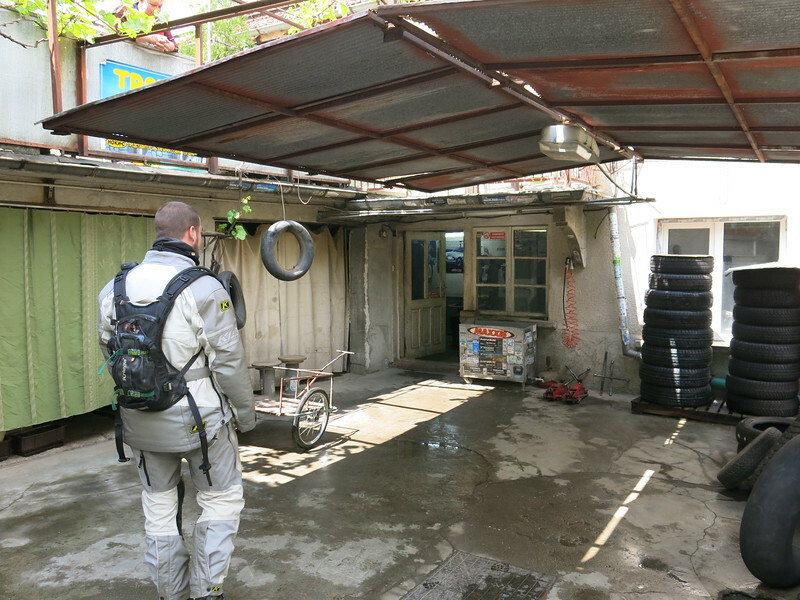 While Sofie works on some blog updates and picture uploads, Jo helps Tony get to the bottom of the fuel leak on his trike. Alpi and Havva leave during the morning for some more exploring around the Balkans before heading back home to Istanbul. By the time we are ready to hit the road, it is already 1PM. But no stress, we’ve got time. Our first aim for the day is to find the tyre shop Yvo recommended to get the tube fixed Jo punctured yesterday. We find the place relatively easy, but unfortunately Yvailu Deev can’t help us with the tube. He does forward us to another shop around the corner. Toshe is very surprised but happy to see us and immediately sets to vulcanizing the tube. Meanwhile his friends and co-workers go check out the bikes and call in some neighbors for good measure. While the rubber is curing we have a great time talking to these guys about bikes and traveling. 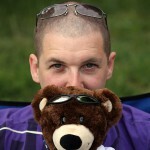 Many photo opportunities ensue. In the end Toshe doesn’t even want to accept any money for the work. True Bulgarian hospitality. 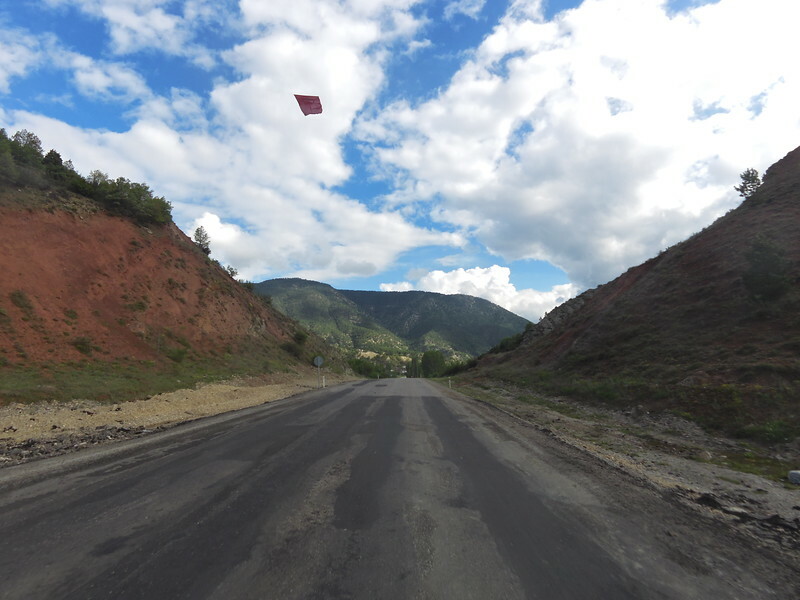 After a short lunch break in Gabrovo we make our way towards the Turkish border through some nice scenery. 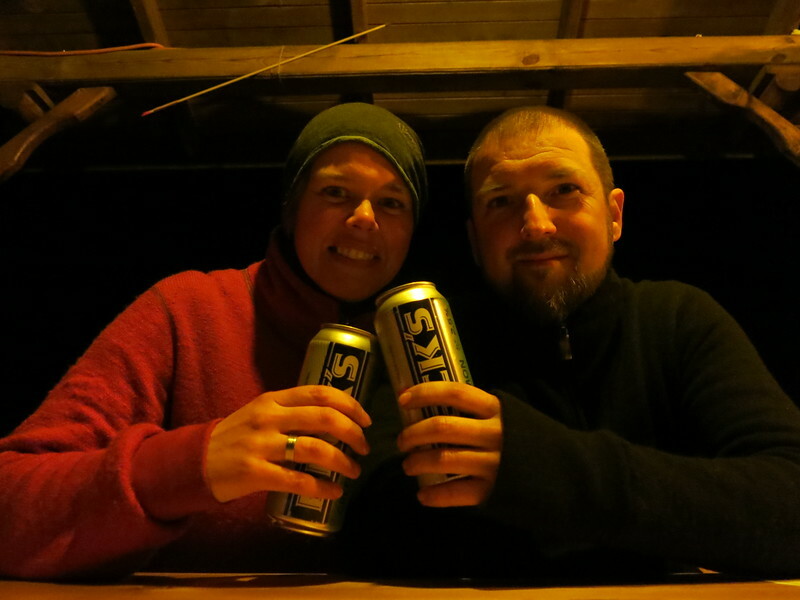 We decided to camp on the Bulgarian side of the border so we can deal with the formalities fully refreshed in the morning. 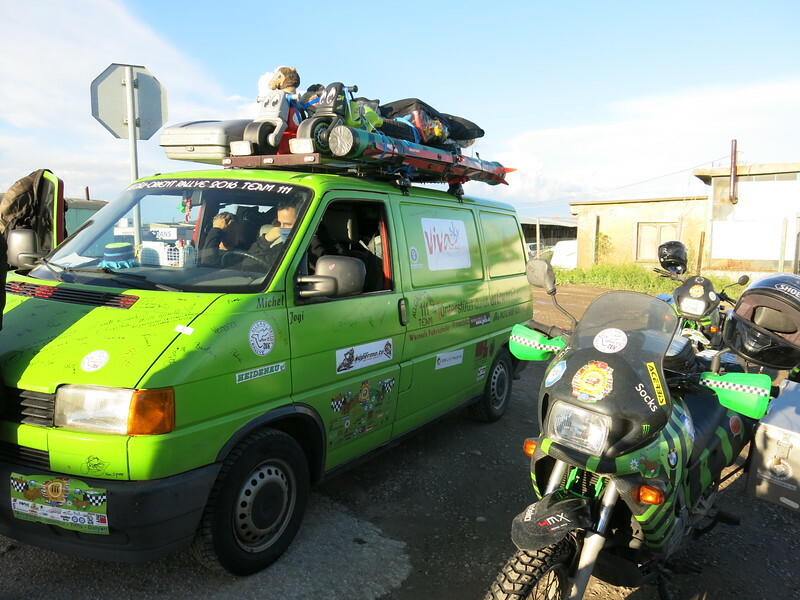 When we arrive at Harmanli we spot a bright green van on the side of the road with some motorbikes parked next to it. We decide to turn back and have a chat. 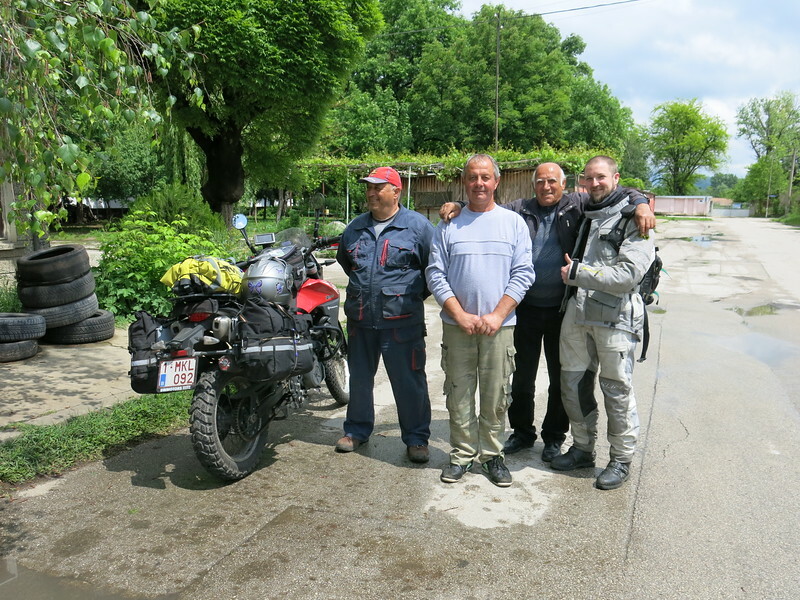 Birgit and her friends are also participating in the Algäu Rally, like the Germans that arrived at Motokamp Bulgaria in the middle of the night. Before we say goodbye we are offered some beers for the evening that we gratefully accept. We end up that evening at Sakar Hills camp site. A nice little place where we meet up with Iris and Wietse. They are travelling in a 4×4 van to Mongolia. It seems that is a popular destination these days. After exchanging some stories and tips we end the evening with a toast to Team 111 “Normal Ja” of the Algäu Rally. The next morning we are up relatively early so we can hopefully get to the border before the biggest rush. That seems to be idle hope, especially for trucks. There’s miles and miles of stationary truck waiting to cross the border. Luckily other vehicles can pass and are processed rather efficiently at both the Bulgarian and Turkish border posts. The Turkish customs lets us off easy and we only have to open up one bag each before they wave us through. Unfortunately though Sofie’s bike refuses to start just at that moment. She has been keeping the ignition turned on for the entire time, with her auxiliary lights on, while charging her battery pack from the bike. On top of that she has been starting the bike every time our line moved up 1 car. So the cause is quickly determined to be a drained battery. Attempts at jump starting the bike fail. 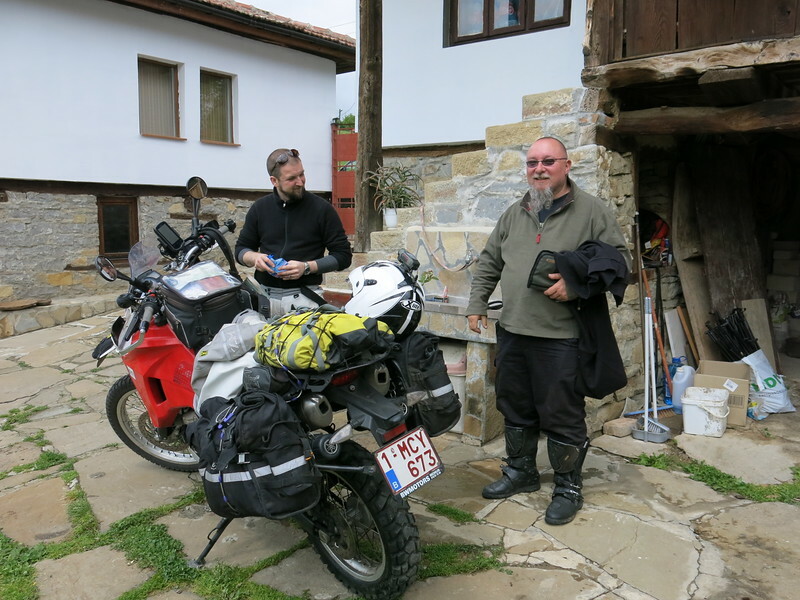 Even with the help of some Bulgarians that took pity on us pushing the bike up and down the customs area. So Sofie is sent on a quest for jump leads. A little while later she scores them from these Dutch guys that are undergoing a more thorough search. 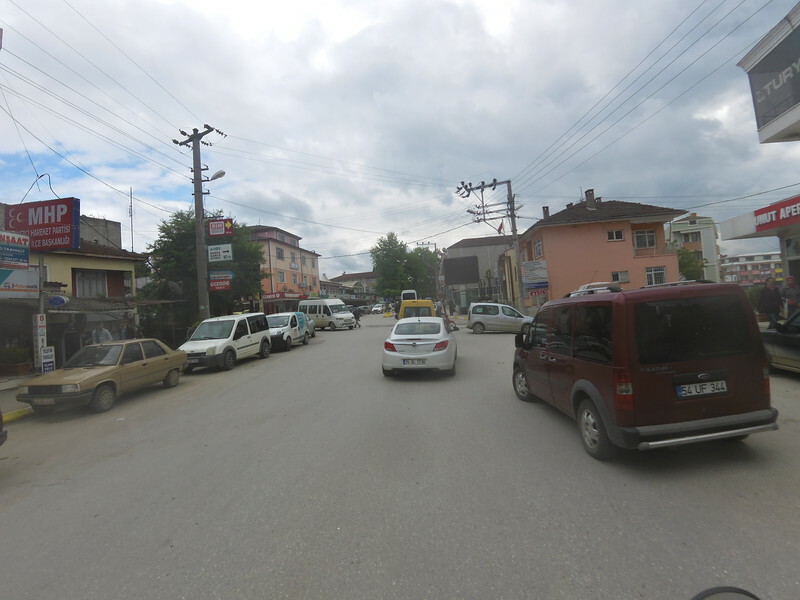 With the delay at the border we won’t be able to get around Istanbul this evening so we look for a camp site in Kilyos at the Black Sea coast north of the city. 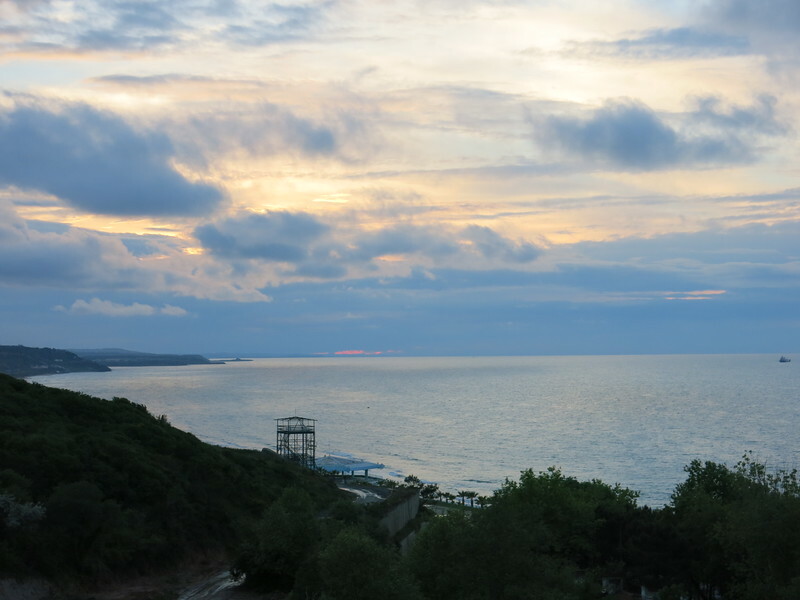 The camp site is pretty basic to say the least, but it is a nice location and we eat some really nice fish in one of the seaside restaurants in the village. After some hail this afternoon we get some additional rain during the night, so in the morning we pack up a wet tent. Getting around Istanbul isn’t as intimidating as we had feared. It takes some assertive driving, but there seems to be a system and some inherent respect to the madness. Besides, on the bikes we do like the locals and use the emergency lane, which is only surveyed by front facing cameras. After Crossing the Bospor and leaving the outskirts of Istanbul we’re back in the countryside. The first part of the day is still pretty grim, wet and cold, but the scenery makes up for most of it. And when the sun finally comes out we really start enjoying the ride. 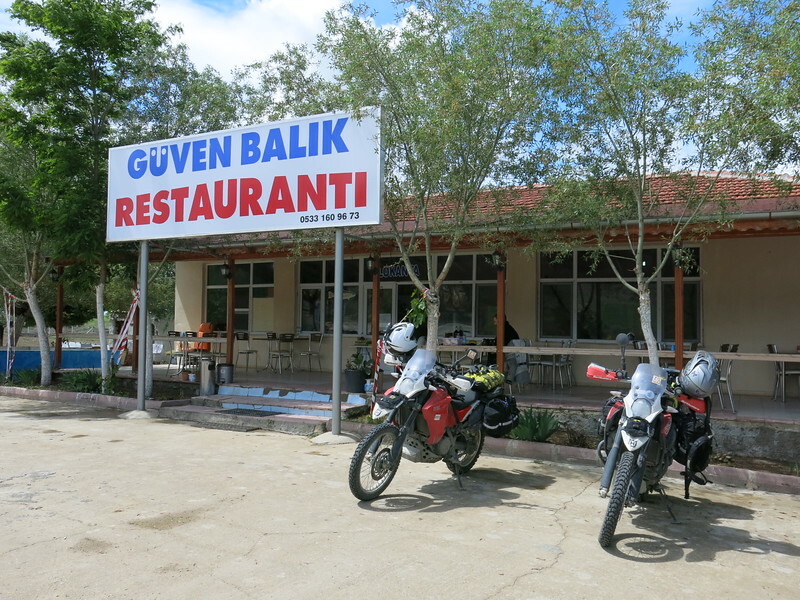 After the cold wet night in the tent we opt for a hotel again, which we find in Beypazari. Hotel Selam does not really have private parking, but we can park our bikes in front of the bank across the street. They are covered with cameras from every conceivable angle over there. While we are unpacking a guy comes over to have a chat. We have a good time and after saying goodbye Suleyman returns 2 minutes later with a gift: some Islamic prayer beads for Jo. We feel immediately welcome! The next morning we can leave early, as we don’t have to pack our tent. The ride gets more amazing with new and inspring views at every hill we cross. But the bad weather keeps threatening. We put on our rain gear but are spared the worst of it this time. Around lunch we stop at a roadside restaurant near a large fishing lake. We don’t mind some fish for lunch, and perhaps some tea to get warm. 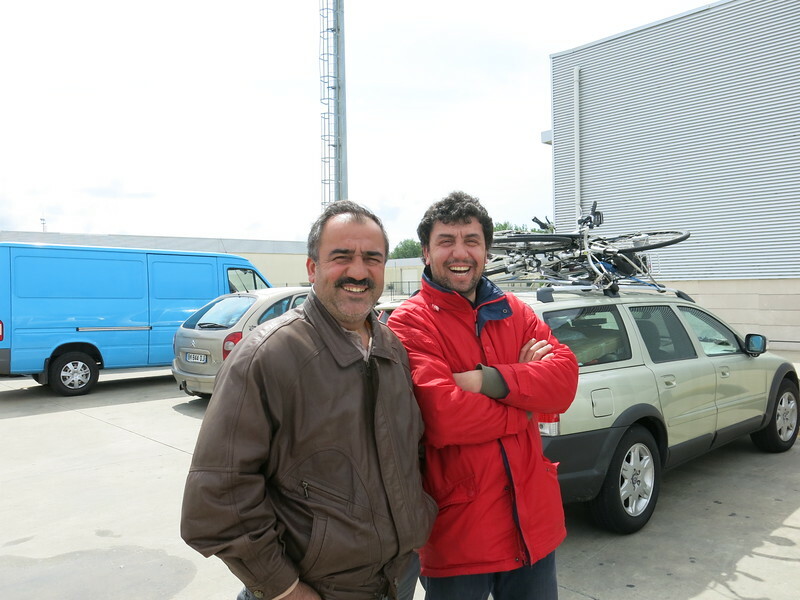 Mustafa and Sedat make sure we are well taken care of. Google translate helps us have an interesting conversation. 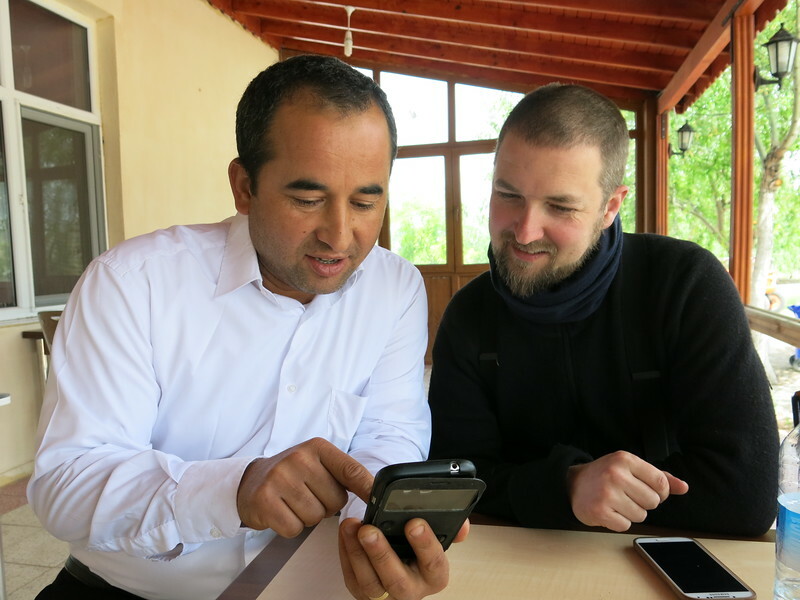 Suffice to say that if anyone is interested in a 7000m² lake surrounded by some amazing Turkish landscapes, Mustafa is the guy to contact. 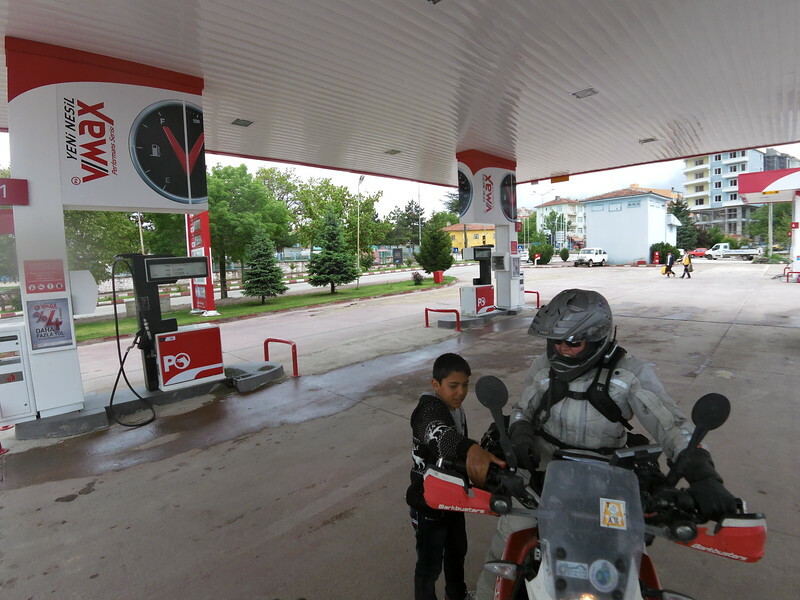 We stop one more time to fill up on gas before entering Cappadocia. At the gas station we are again reminded of the great hospitality of the locals. Eren was parked behind us and comes over to asked where we are from. He also gives us his phone number and says we can call him any time if we ever need help while in Turkey. We return the good vibes by making a kid that was hanging out at the gas station very happy. He gets to sit on Jo’s bike and start it and afterwards he also gets to start Sofie’s bike. 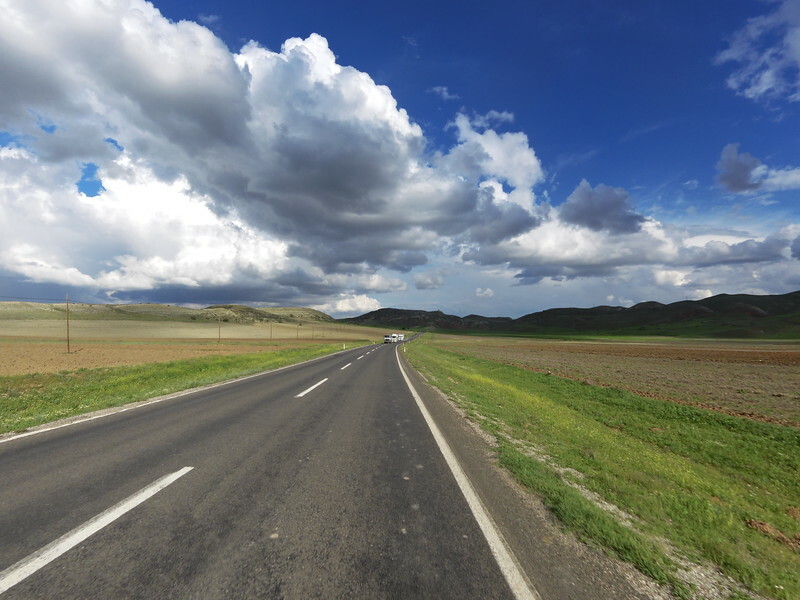 Around 3PM we arrive in Göreme, the most well known town in Cappadocia and ride directly to the camp site we had looked up yesterday in the Hotel. There are only 3 other people sharing the spaces with us. 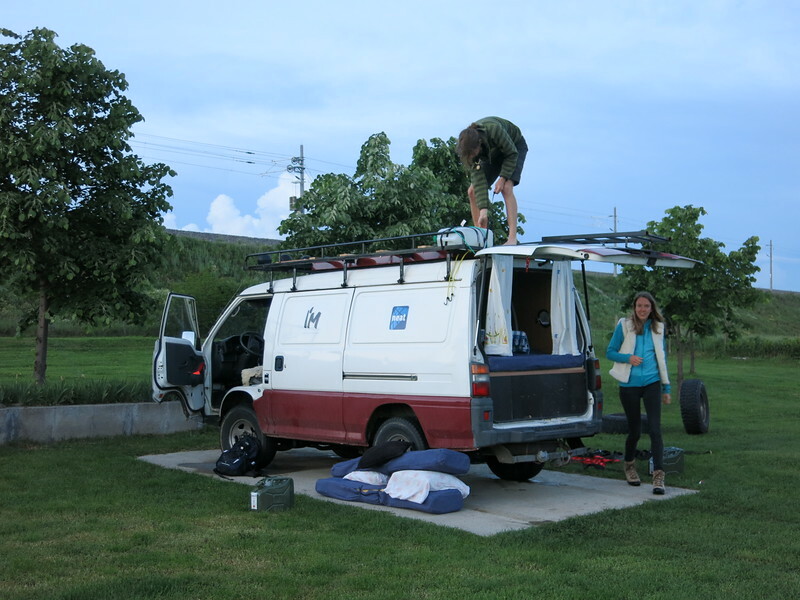 Giona and Uliana are riding a 4×4 van to Mongolia, along more or less the same road as us. Mongolia is going to be pretty crowded if these meet-ups continue. Especially since the other guy staying at the camp site is a Swiss cyclist, planning to ride his e-bicycle with solar panel trailer all the way to… you’ve guessed it! We have a look at our plans. The weather forecasts for tomorrow aren’t great, but at least a little better than we had today. Sunday should be better, but still not great for taking a balloon ride. On top of that, we hear that the balloon rides are around 100€ per person. And that’s for the low season. We decide it’s not worth that much money for us, especially if the weather is less than ideal. But we do consider spending a few nights here and hiking the famous sights of Cappadocia.